Torture in the United States includes cases of torture reported in the United States and outside the USA by U.S. government workers. 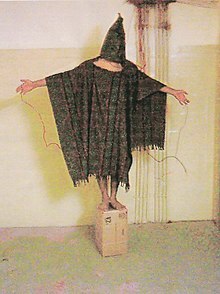 A hooded prisoner at Abu Ghraib prison who was told he would be electrocuted if he fell off the box. The United States and other countries involved in the War on Terror have used torture to get information from suspected terrorists. Some of the most well known cases of torture involving the U.S. are the Abu Ghraib scandal and Guantanamo Bay. Starting in 2004 there were reports of abuse of prisoners at the Abu Ghraib prison in Iraq. The New Yorker newspaper had an article in May 2004 about the abuse and the article had pictures that were taken by soldiers involved. According to an investigation by the Department of Defense called the Taguba Report, the military had been looking into the abuse since 2003. In the end nine soldiers were discharged from the military and sent to prison. Human rights organisations like Amnesty International have said CIA agents used waterboarding and other inhumane ways to get information out of prisoners at Guantanamo Bay. Because of the abuse President Barack Obama ordered the base to be closed down. ↑ 1.0 1.1 "War on Terror | Global War on Terrorism". Retrieved 2009-03-28. ↑ "Torture Scandal Timeline". Retrieved 2009-03-28. ↑ "Binyam Mohamed: MI5, torture and terrorism". Retrieved 2009-03-28. ↑ "Lawyers condemn UK over torture in 'war on terror'". Retrieved 2009-03-28. ↑ "Top Bush aides pushed for Guantánamo torture". Retrieved 2009-03-28. ↑ "The Road to Abu Ghraib". Retrieved 2009-03-29. ↑ "Iraq: One year on the human rights situation remains dire". Retrieved 2009-03-29. ↑ "Obama Reverses Key Bush Security Policies". Retrieved 2009-03-29. ↑ "Closure of Guantanamo Detention Facilities". Retrieved 2009-03-29. This page was last changed on 1 April 2018, at 23:40.